IRBIL, IRAQ (AP, SEPTEMBER 25, 2017) — Iraqi Kurds were casting ballots on Monday in Iraq's Kurdish region and disputed territories on whether to support independence from Baghdad in a historic but non-binding vote that has raised regional tensions and fears of instability. 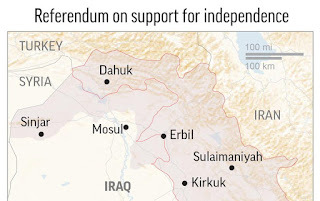 More than 3 million people are expected to vote across the three provinces that make up the Kurdish autonomous region, as well as residents in disputed territories — areas claimed by both Baghdad and the Kurds, including the oil-rich city of Kirkuk — according to the Independent High Elections and Referendum Commission, the body overseeing the vote. Lines began forming early in the day at polling stations across Irbil, the Kurdish regional capital. Tahsin Karim was one of the first people to vote in his Irbil neighborhood. "Today we came here to vote in the referendum for the independence of Kurdistan," he said. "We hope that we can achieve independence." The Kurdish region's president, Masoud Barzani, also voted early on Monday morning at a polling station packed with journalists and cameras. At a press conference in Irbil on the eve of the referendum, Barzani said he believed the vote would be peaceful, though he acknowledged that the path to independence would be "risky." "We are ready to pay any price for our independence," he said. 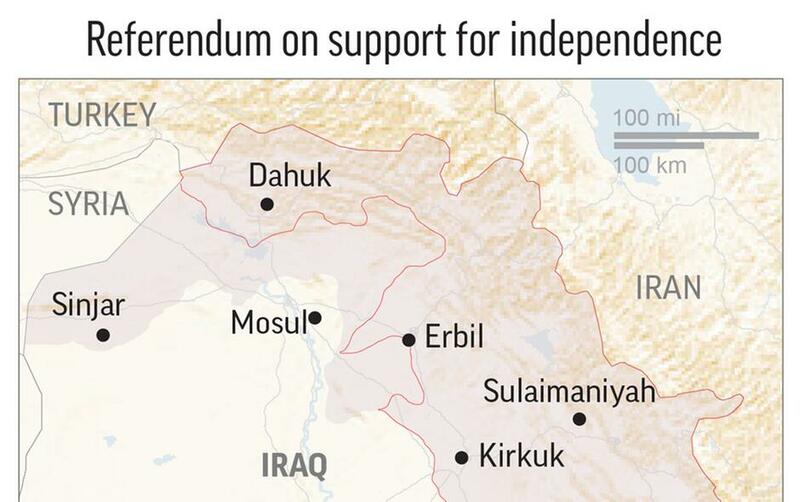 The referendum is being carried out despite mounting opposition from Baghdad and the international community. The United States, a key ally of Iraq's Kurds, has warned the vote will likely destabilize the region amid the fight with the Islamic State group. The Iraqi central government has also come out strongly against the referendum, demanding on Sunday that all airports and borders crossings in the Kurdish region be handed back to federal government control. In a televised address from Baghdad on Sunday night, Iraqi Prime Minister Haider al-Abadi said that "the referendum is unconstitutional. It threatens Iraq, peaceful coexistence among Iraqis and is a danger to the region." "We will take measures to safeguard the nation's unity and protect all Iraqis," he added. In a strongly worded statement, Turkey said on Monday that it doesn't recognize the referendum and declared its results would be "null and void." Turkey's Foreign Ministry called on the international community and especially regional countries not to recognize the vote either and urged Iraq Kurdish leaders to abandon "utopic goals," accusing them of endangering peace and stability for Iraq and the whole region. The ministry reiterated that Turkey would take all measures to thwart threats to its national security. On Saturday, Turkey's parliament met in an extraordinary session to extend a mandate allowing Turkey's military to send troops over its southern border if developments in Iraq and Syria are perceived as national security threats. Initial results from the poll are expected on Tuesday, with the official results to be announced later in the week. At his press conference, Barzani also said that while the referendum will be the first step in a long process to negotiate independence, the region's "partnership" with the Iraqi central government in Baghdad is over. He detailed the abuses Iraq's Kurds have faced by Iraqi forces, including killings at the hands of former leader Saddam Hussein's army that left more than 50,000 Kurds dead. Iraqi Kurds have long dreamed of independence — something the Kurdish people were denied when colonial powers drew the map of the Middle East after World War I. The Kurds form a sizable minority in Turkey, Iran, Syria, and Iraq. In Iraq, they have long been at odds with the Baghdad government over the sharing of oil revenues and the fate of disputed territories like Kirkuk. The Kurds have been a close American ally for decades, and the first U.S. airstrikes in the campaign against IS were launched to protect Irbil. Kurdish forces later regrouped and played a major role in driving the extremists from much of northern Iraq, including Mosul, the country's second largest city. But the U.S. has long been opposed to Kurdish moves toward independence, fearing it could lead to the breakup of Iraq and bring even more instability to an already volatile Middle East. In Baghdad, residents strongly criticized then referendum, saying it would raise sectarian tensions and create an "Israel in Iraq." An Arabic newspaper headline said "Kurdistan into the unknown," a reference to the name Kurds use for their region. "This is a division of Iraq," said journalist Raad Mohammad while another Baghdad resident, Ali al-Rubayah, described the referendum as a "black day in the history of the Kurds." Lawyer Tariq al-Zubaydi said the referendum was inappropriate amid the "ongoing threat of terrorism and Islamic State" militants. "The country is going through a difficult period, this requires a coming together of our efforts, he said. "A unified country is better for all." Voting was also underway on Monday morning in Kirkuk. The oil-rich city has large Kurdish, Arab, Turkmen and Christian communities and has seen some low-level clashes in the days leading up to Monday's vote. "I feel so great and happy, I feel we'll be free," said Suad Pirot, a Kirkuk Kurdish resident, after voting. "Nobody will rule us, we will be independent." Associated Press writers Ali Abdul-Hassan in Irbil, Iraq, Bram Janssen in Kirkuk, Iraq, and Suzan Fraser in Ankara, Turkey, contributed to this report.